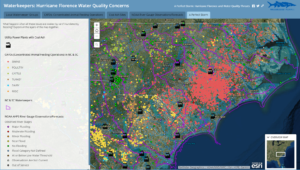 Pollution and water don’t mix — unless you live in the Carolinas, place major pollution sources in floodplains or too close to water, have a hurricane with heavy rain, and flood those pollution sources. Riverkeeper Sam Perkins loves maps and GIS. He created a map in part to illustrate how we have brewed a dangerous storm of not just rain but also pollution. The map also helps Riverkeepers prioritize response areas and coordinate their documentation of observations from planes, boats and the ground. Industry, lawmakers and regulators seem to have learned little just two years after Hurricane Matthew and two decades after major hurricanes of the late 1990s (e.g. Floyd in 1999). Perhaps North Carolina’s most infamous hurricane — Hazel (1954) — should have given adequate warming to such dangerous siting of pollution sources. When legislative sessions start back in 2019, we hope legislators will learn that industrial agriculture (CAFOs), coal ash sites and other pollution sources cannot be allowed to be left vulnerable to flooding. We know better. We have for a long time. Click the arrow below to flip through his story map. Enlarge the screen to see a legend. The Carolinas were hit by a number of large hurricanes in the past two decades, nonetheless the past century. For the Carolinas, hurricanes with major rainfall and flooding were especially prominent in the late 1990s. On countless occasions, we have had opportunities to realize that in the future, we need to prevent a perfect storm of flooding and pollution. Take a stroll down memory lane. August 7, 1995 – Tropical Depression Erin dissipates over the Appalachian Mountains and drops light rainfall in the state’s western portion. September 6, 1996 – Hurricane Fran makes landfall near Wilmington with winds gusts peaking at 137 mph and a 10-foot storm surge. In North Topsail Beach and Carteret County alone, the hurricane damages or destroys 6,688 structures, while further inland, heavy rainfall causes river flooding. Across the state damage amounts to about $2.55 billion (1996 USD, $3.35 billion 2007 USD), becoming, at the time, the state’s worst natural economic disaster. The hurricane causes a total of 14 deaths in the state, of which eight were indirect. October 18, 1999 – Hurricane Irene parallels the state’s coastline just offshore, dropping further heavy rainfall to coastal regions. Some additional flooding is reported, and one indirect death occurs due to a traffic accident.